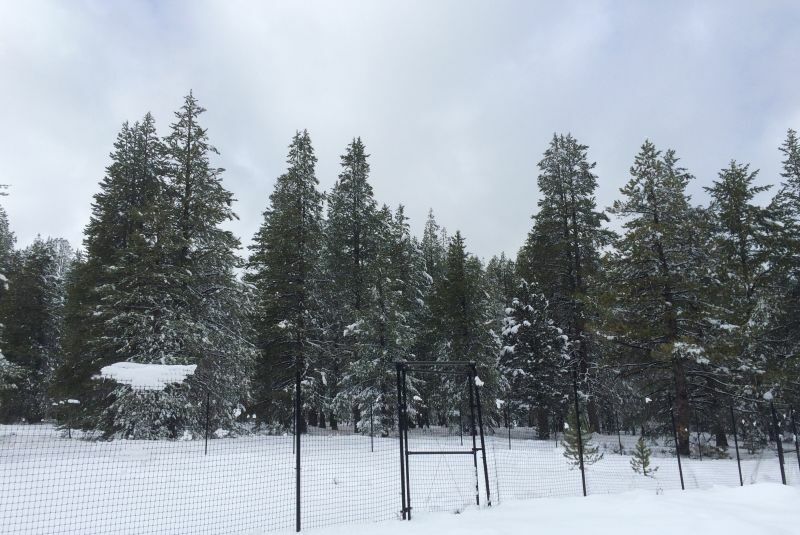 At the University of California Berkeley’s Sagehen Creek Field Station in the Eastern Sierra Nevada, small groups of plant species weather out a harsh winter under several feet of snow. There’s not much to see, let alone anything that resembles art. But hard though it may be to believe, the specimens are in fact part of the latest game-changing ecological art project by Helen Mayer Harrison and Newton Harrison. To hear my radio profile of Helen and Newton Harrison for KQED FM News and The California Report, click here. One of the Harrisons many eye-catching maps: "The Sagehen ecosystem and experimental sites"
Widely known as the parents of the eco-art movement, the Harrisons have become world-renowned for using art to tackle environmental problems on a massive, global scale. Over more than four decades, the Santa Cruz-based husband-and-wife team have inspired the public to get behind environmental issues, from climate change to the impact of urbanization on the ecosystem -- and on occasion have even successfully helped to bring about high-level environmental policy change. 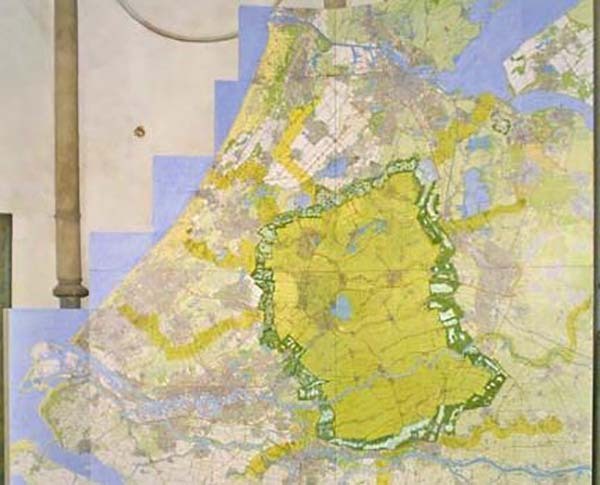 “These are million-square-kilometer problems,” says Newton of the issues that he and Helen address with their work. The Harrisons’ acclaim is so great that a few years ago the Getty Research Institute and Stanford University both expressed interest in housing their archives. Stanford won. “We are delighted that the Helen and Newton Harrison archive came to Stanford University,” says Peter Blank, Senior Librarian at Stanford’s Bowes Art & Architecture Library. “Their engagement with the hard questions of our day -- what are our shared responsibilities on a planet fraught with ecological uncertainties -- and the manner in which they integrate the arts and sciences has resulted in a remarkably rich body of work.” And now the artists, who are both in their eighties, are the subject of a kaleidoscopic book, which Random House will put out later this year. Under deep snow at UC Berkeley Sagehen Creek Field Station in the Eastern Sierra Nevada, groups of plant species hibernate as part of a 50-year-long environmental art project implemented by The Harrisons in collaboration with scientists and members of the Washoe Tribe. At Sagehen, the Harrisons are collaborating with a small team of scientists and members of the Washoe Tribe on a 50-year-long project. It involves physically moving groups of plant species like wild rose and red fir to higher ground with the aim of helping the seedlings become resilient both to the warming effects of climate change and at different altitudes. The Sagehen investigation is part of an even bigger project, entitled The Force Majeure, which looks at finding solutions to two problems through conducting experiments in four different parts of the world -- encroaching water levels and rising temperatures. "These are two vast forces that we have speeded up to say the least," Newton says of co-opting the legal term "force majeure" which means a huge power that cannot be controlled, kind of like an act of god. "We consider them a force majeure. Why? Go ahead and stop them if you can. But there may be a counter-force on the horizon and that is what we search for." 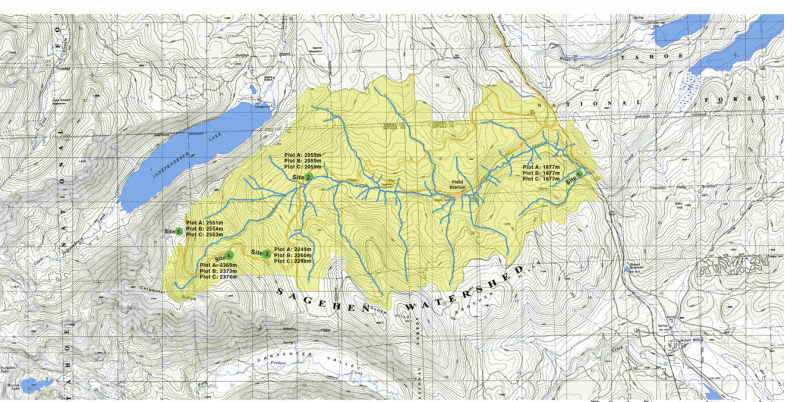 The Harrisons’ deep interest in involving people of the Washoe Tribe -- who for thousands of years have called the Sagehen area and beyond their ancestral home -- adds an important dimension to the project because of the Native Americans’ deep knowledge of the local ecosystem and its indigenous species. Tribal elder Benny Fillmore says this is the first time he’s ever been asked by anyone outside of his tribe to collaborate on an art project. “I think it’s really rare in this day and age as tribal members to be given a hand in such a big project,” Fillmore says. UC Berkeley Sagehen Creek Field Station managers Jeff Brown and Faerthen Felix. Sagehen is collaborating with Newton and Helen Harrison on one part of their massive, global "Force Majeure" project. 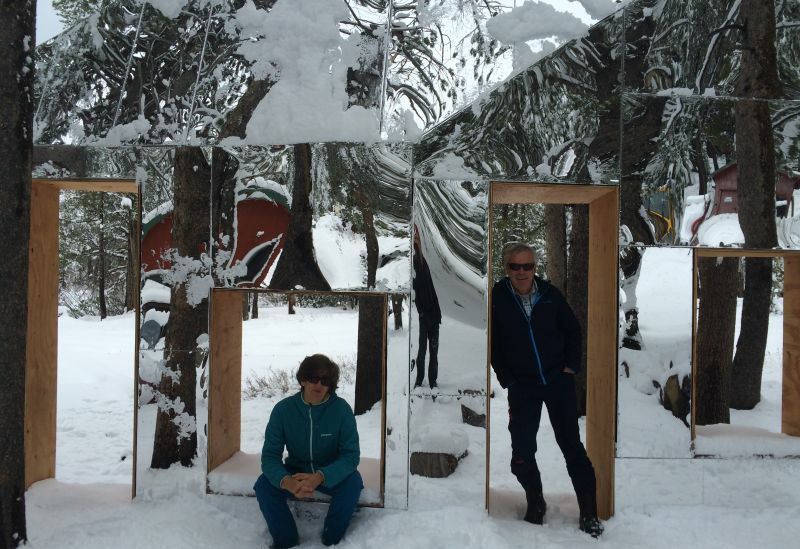 Here we see them posing in front of another site-specific art project on site at Sagehen, "Invisible Barn". The Harrisons’ ability to connect people and ideas that normally wouldn’t come into contact with one another is one of their greatest assets. Sagehen field station manager, Faerthen Felix, says the station’s relationship with the Harrisons is helping to find a wider audience for important but usually dry scientific data. "The problem is that science is by nature a non-emotional process," Felix says. "You have to be dispassionate. The data has to speak for itself. But that’s not what humans are like. Emotion is what drives us. And emotion is the raw material that artists use." The Harrisons first met in 1950 at Helen’s family farm in Connecticut. Newton was a budding sculptor still in his teens, and Helen, a few years his senior, a teacher, philosopher and student of English literature. The couple didn’t formally start working on art projects together until 1969, when they both landed jobs at the University of California, San Diego. Newton taught art and Helen ran educational programs. 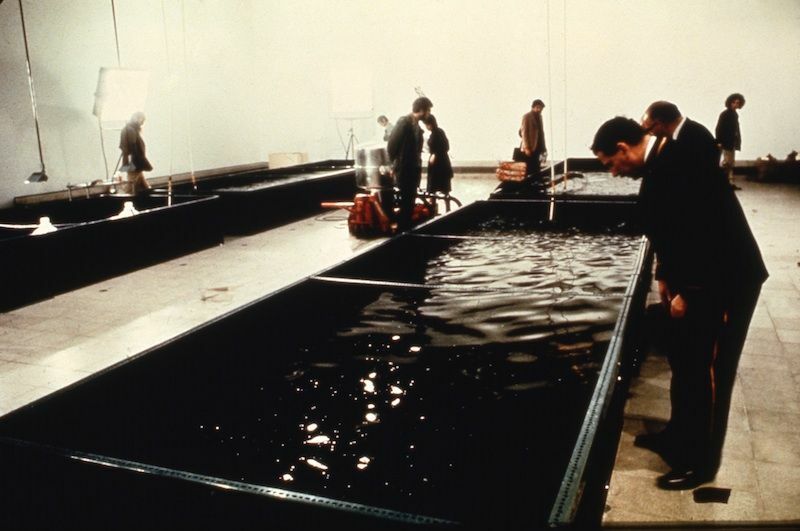 Composer Edward Lambert even turned the debacle into a chamber opera entitled The Catfish Conundrum two years ago, with Newton Harrison and the catfish among the characters represented on stage. 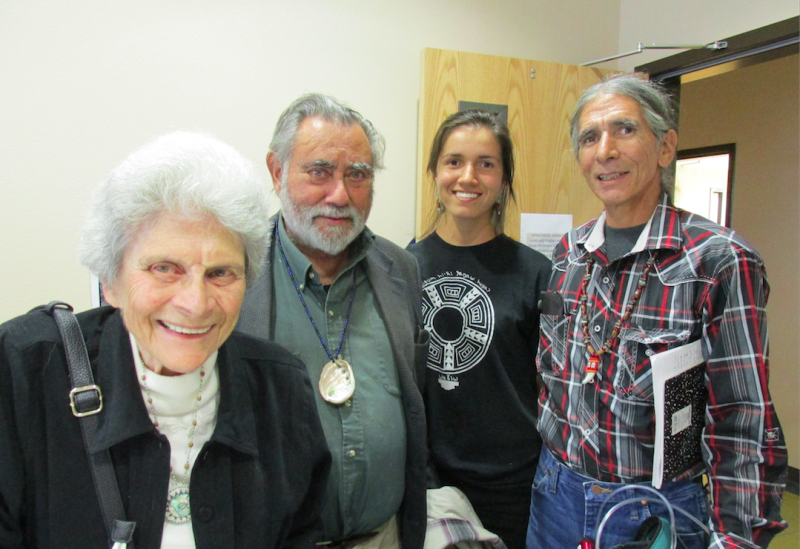 Helen Mayer Harrison and Newton Harrison with Benny Fillmore of the Washoe Tribe and his daughter, Helen.